Dunlop Biomimetic Elite squash racket, which is used by Greg, current world #1. Though he may actually be playing with an earlier model of a similar racket the Dunlop Custom ICE Elite and had it spray-painted to look like the Biomimetic Elite. A solid all round indoor sports shoe that is used by Greg and has been for quite a number of years now. Many of the elite players are turning to this shoe because of the stability and grip it offers them when moving so dynamically into and out of the corners. adiTUFF – This is an abrasion resistant material in the toe-upper. This is where indoor court shoes seem to wear out quickest due to dragging of the feet. This increases durability. Energysling – Wraps the top of the foot, stretching and springing back during side to side movements so energy loss is minimized. Ring Core Dual Density EVA – Offers additional power and speed enhancing multi-directional movements. Motion Guiding System – Stability system which enhances movement power when hitting the court hard. The Dunlop Tac Performance 8 Racket Bag has the following features: The Dunlop Tac Performance 8 Racket Bag is suitable for both tennis and squash rackets. The bag has two large pockets in which a maximum of 8 rackets can be carried. The racket bag is also provided with various pockets on the sides and a special pocket for shoes. All pockets have a zipper. The racket bag is provided with two detachable, adjustable shoulder straps which offers the possibility to carry the bag as a backpack. 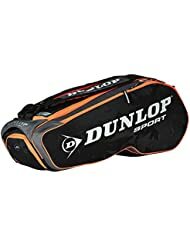 Specifications: Dunlop racket bag for squash and tennis rackets Maximal 8 rackets Various pockets, all with zipper Two adjustable, detachable shoulder straps Material: 100% polyamide Colour: black – orange – grey Size: 81 x 28 x 33cm. Greg’s clothing sponsor is Dunlop and he uses a variety of their clothing lines, the good news is that they are all available pretty cheaply. Greg has been using these for a couple of years now to aid recovery, movement balance and protect against injury.